A few years ago Hydrodynamica Project photographer Ryan Field developed a technique for photographing surfboards and objects associated with the Hydrodynamica here in the loft. He built a lighting structure and experimented with a variety of formats. The results were impressive. Ryan came out from Brooklyn last week to shoot more boards. He built a bigger and better lighting system, and for the past five days he has been photographing the boards shown in our Pacific Standard Time exhibit, as well as a host of other relevant boards we have gathered. The loft is full of an amazing gathering of boards: Greenough, Simmons, Lis, Diffenderfer, Gephart, Frye…and dozens of the absolute latest, state-of-the-art creations by Daniel Thomson and Ryan Burch. Legendary surfer Bob Simmons was a lot of things: a Caltech dropout, moody, eccentric, and most of all, a genius. He fast-tracked surfing’s evolution by making surfboards lighter and more responsive before tragically drowning at Windansea Beach in 1954. But surf historian Richard Kenvin wants people to know that Simmons is more than a historical footnote. Kenvin’s Hydrodynamica: Remember the Future, an exhibit that opened this past weekend at Space 4 Art/Loft 9 Gallery (325 15th St. San Diego), showed that Simmons continues to push surfboard design forward. The exhibit is part of Pacific Standard Time, a collaboration between more than 60 cultural organizations coming together to celebrate art in Southern California. Surfers and artists filed into the gallery to admire Simmons’ unique balsa-wood surfboards. Why was Simmons so ahead of his time? His understanding of physics gave him license to experiment with surfboard materials, shapes and fins long before other shapers. He was also famously reclusive. Free from the court of public opinion, he pursued radical designs that foreshadowed the shortboard and fish designs, crucial developments in the surfboard. Attendees at the opening on Saturday also gazed at cutting-edge designs from current San Diego shapers like Carl Ekstrom and Ryan Burch (who were at the reception), among others. Some of Burch’s designs, in particular, looked influenced by Simmons’ plank-like surfboards. Six decades later, Simmons remains relevant. Hydrodynamica: Remember the Future will be on display until March 9. Opening night was a huge success. Thank you to all who attended, participated and made the event possible. The exhibit is free and open to the public from now through March 9, 2012. Public viewing hours are Tuesday-Saturday from 10am-4pm. The exhibit is located at Space4Art’s gallery at 325 15th Street, San Diego, CA 92101. We will be hosting a lecture that will include the curator, shapers/designers and/or others closely related to the exhibit in March, as well as an exciting closing event. So please check back. Special thanks to Space 4 Art, Volcom and Vans. Below are some fun people pics. If you would like to post any pics from the exhibit, please send to mb@hydrodynamica.com. We welcome them! The “Future” room is near completion, customized displays are being built and painted; huge prints will cover two main walls in the the “Remember” room. Film edits are being completed, surfboard and artifact descriptions are being finalized, signage is going up…John Elwell stopped by the gallery today. We’re pretty busy here. Irwin Conspiracy and Steve Poltz will be setting up on the huge outdoor stage tomorrow. We will have refreshments (beer/wine) and a food truck here. Carl Ekstrom will have surfboards on display and available for sale, custom surfboards by Hydrodynamica will be available to order, signed photographs by John Elwell and Ryan Field…t-shirts and more. The tale of Bob Simmons, a pre-beatnik surfer from Pasadena, who dropped out of Caltech and then avoided World War II when he injured his arm in a bicycling accident at Beverly Boulevard and Vermont Avenue, once was an underground legend. Now La Jolla’s Richard Kenvin, a surfing legend in his own right, has resurrected the man, the myth, by curating a new art show. Pacific Standard Time, the regionwide initiative celebrating the postwar art of Southern California, has taken on Simmons via “Hydrodynamica: Remember the Future,” beginning Jan. 28 at San Diego’s Loft 9 and Space 4 Art. Simmons’ boards are now arguably the most collectible in the sport. But do planks meant for sheer recreation constitute art? They are beautiful things: curvy, sometimes asymmetrical blades of balsa, based on the form-follows-function ethos but utterly sleek and eye-pleasing in their mission to facilitate human symbiosis with the ocean. Simmons’ shapes have been on display at the Surfing Heritage Foundation in San Clemente and the Honolulu Surf Museum. Outsized Los Angeles Times publisher and sportsman Otis Chandler proudly owned a Simmons that dated to the 1930s. There are, however, sometimes opposing schools about who truly invented the modern surfboard. Joe Quigg was a Simmons conspirator who built similar vehicles at the time and who now discounts his friend’s influence. More than an architect of boards, Simmons became a pre–James Dean, pre–The Wild One archetype of the California rebel. He camped out in his car, slept on the beach and rode rare waves, often solo and without a wet suit, in the coldest winter months. The coastal highway was his muse. What’s appropriate about Simmons’ inclusion in PST is that he was pan–Southern Californian, known to ride the surf of Tijuana Slough, at the U.S. border, as much as he would dominate that of Windansea or Malibu with a strikingly casual stance and a studied, parallel line down the face of a wave. Kenvin notes that Simmons, for instance, taught Hawaiian big-wave pioneer George Downing how to repair a board using resin after Freeth banged his ride into Malibu Pier in 1948. In addition to the San Diego exhibit, Kenvin, a Renaissance man of surf culture who once owned a streetwear company called Stoopid, has been working on a documentary, also called Hydrodynamica, about Simmons and the boards that would follow his lead, including some of the wide, twin-fin “fish” shapes to be included in the exhibit. 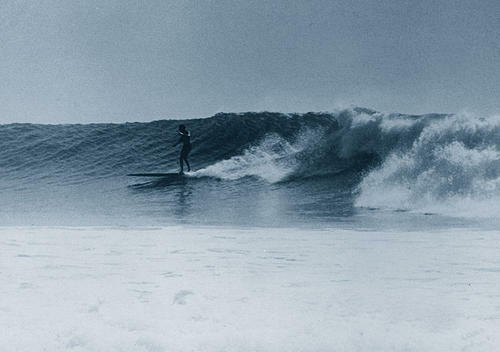 The fish opened the door to the radical, wave-ripping style of the 1970s and beyond. Surfing went from cruising to slashing via the likes of Mark Richards, Larry Bertlemann and Buttons Kaluhiokalani. Elwell, Simmons’ San Diego surfing pal, kept Simmons’ story alive through the last few decades via his collection of Simmons-related items — photos, writings, articles and even boomerangs — some of which are featured in the exhibit along with vintage boards. The 50-year-old Kenvin, who prefers to surf Windansea, home of the Tom Wolfe–chronicled surfing clan The Pump House Gang and site of Simmons’ last wave, defends Simmons’ singular influence. Most of the pieces for the “Remember” room have been hung. Now it’s onto the “Future” room with new pieces/surfboard artifacts by Carl Ekstrom (also featured in the “Remember” room), Daniel Thomson and Ryan Burch. Carl and Denise Ekstrom visting Hydrodynamica/Loft 9 Gallery; Mark Weiner and Richard Kenvin hanging and arranging exhibit artifacts for the upcoming show.